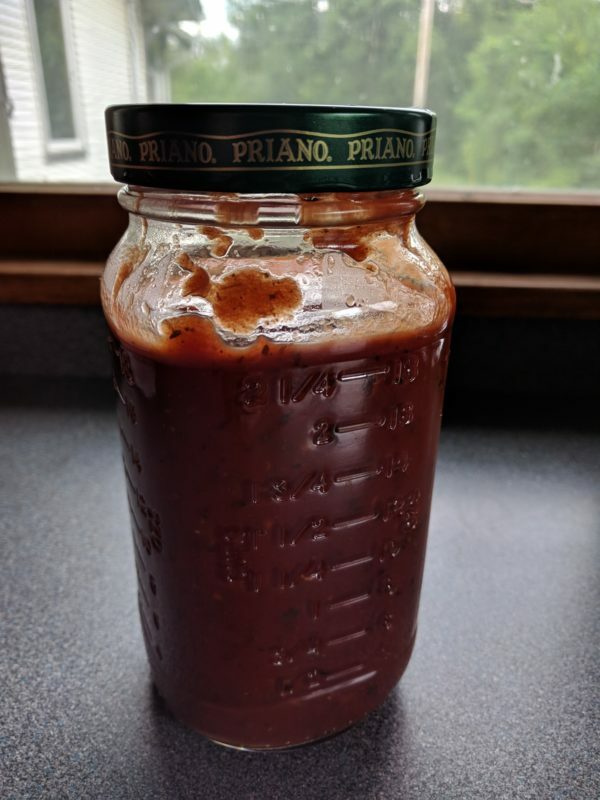 This was my first attempt at spaghetti sauce in my Instant Pot. It might change later, but this was really good. The kids came back for seconds and thirds! Put 1 cup of water into bottom of Instant Pot. Put sausages into water or onto trivet. (Mine were frozen and I put right into the water.) Cook on high pressure for 1 minute. Let pressure naturally release for 10 minutes or so. 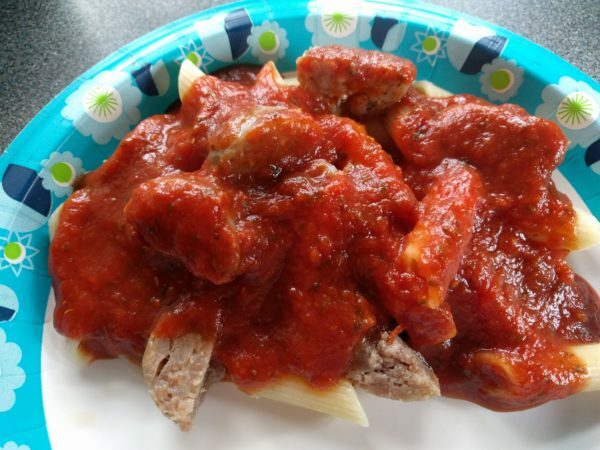 Remove sausages from the pot, but leave cooking water in the pot for additional flavor. Add all remaining ingredients to pot. Pressure cook for 5 minutes. Let pressure naturally release for 10 minutes or so. Meanwhile, slice the sausage. You can either add it to the sauce or serve it on the side. 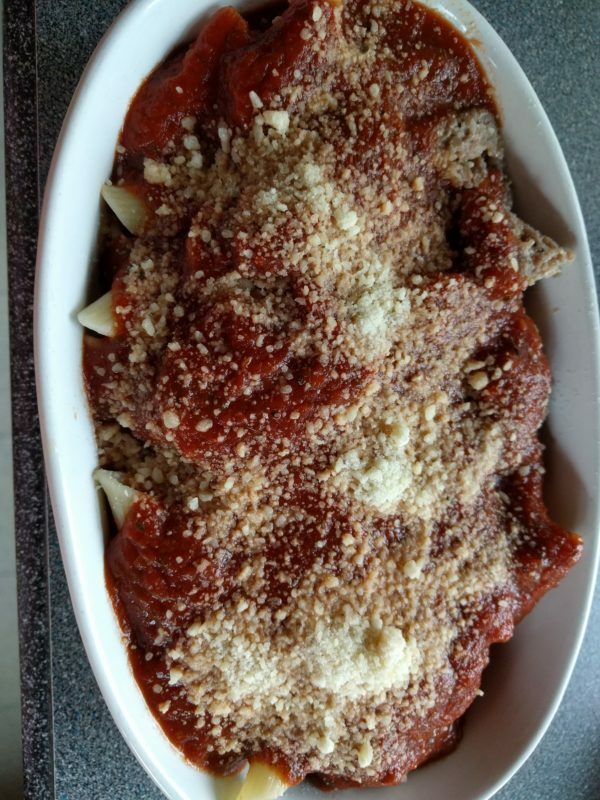 I chose to serve it with some pasta and Parmesan. Stir and taste; add additional seasoning, if desired. This is our favorite recipe for chili. If I don’t have any chorizo, I just use 2 lb. of ground beef and increase the paprika and cumin to 2 T. each. Some of you might think it odd to add the cocoa powder or chocolate chips. However, this adds a richer taste and color to the finished product. 2 T. Lea & Perrin's Worcestershire sauce This brand is gluten free & soy free. 1/2 cup beef broth I use 1 tsp. Better than Bouillon organic beef base and 1/2 cup water to insure that it is gluten and soy free. Rinse black beans. Put in pot and cover well with water. Bring to a boil. When the water boils, turn the pot off and let set for 1 hour. Drain beans, cover with fresh water and continue cooking until tender. Add to chili when the beans are tender. While beans are soaking, brown beef and chorizo with onions, sweet pepper, garlic, and oil in a Dutch oven. Add remaining ingredients (except black beans) and simmer for a couple of hours. Add water as needed for the consistency that you desire. Add black beans when they have finished cooking. This is even better if made the day before and reheated. I learned that this is a Texas style chili because it has no beans. 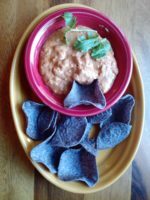 Personally, I prefer my chili with beans, but this works fantastic in this dip! Brown beef with onions, sweet pepper, jalapenos and garlic in the oil. Add remaining ingredients and simmer for a couple of hours. Add water as needed for the consistency that you desire. Serve with desired condiments: corn chips, cheese, sour cream, green onions, cilantro, etc. If you don't have beef base, just use beef broth in place of the beef base and water. Just read ingredients first if you have food allergies! I used to make this recipe for parties a lot! 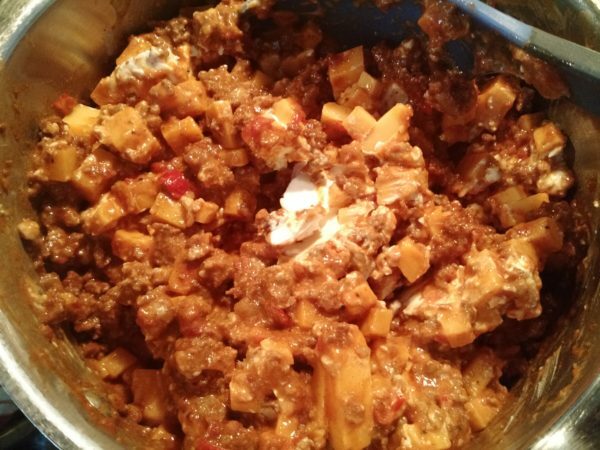 : http://www.cherylsrecipes.net/recipe/chili-dip/ It was super fast and easy. However, when I found out that I had wheat and soy allergies, I could no longer make it because every single canned chili I can find has soy (along with a lot of preservatives) in it! I am also not a big fan of Velveeta because it is so processed. 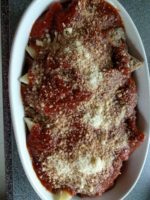 So I came up with this recipe as a replacement and it is even better, although obviously not as easy! It is still not too difficult though. I will certainly be making it again! 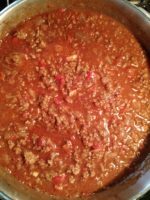 If you would rather used canned chili for the convenience, just use 3 cans of chili in this recipe. Or, if you have a favorite chili recipe (with or without beans), substitute about 6-7 cups of that for this chili. 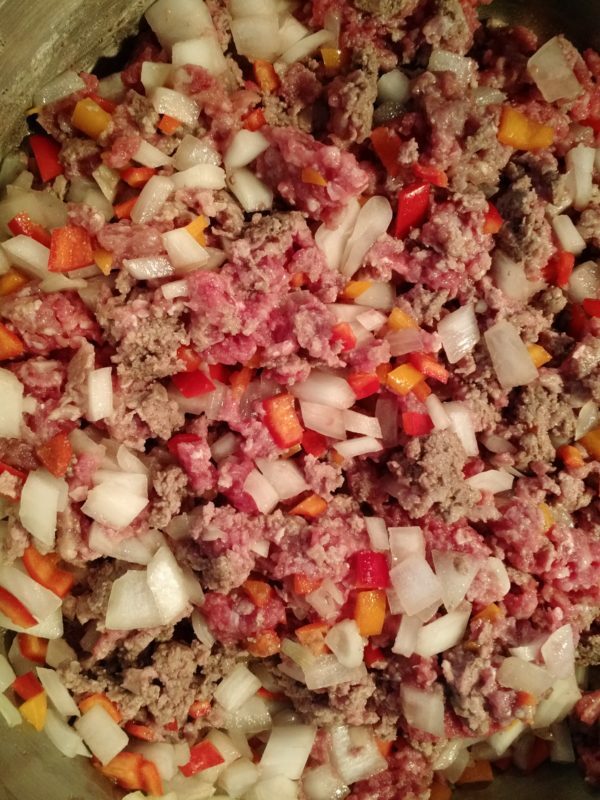 In a large, deep pot, brown ground beef, onion, sweet pepper, garlic, and jalapeno in the oil. Add all remaining ingredients except cheese and cream. Simmer for a couple of hours until it is cooked down and quite thick. Add cheeses to the chili. Stir over medium or low-medium heat to melt the cheeses. Add a little heavy cream for a better texture. Serve with tortilla chips. I garnished mine with cilantro. My husband liked it even better with the cilantro.